He was a self-taught musician who fought epic battles with music industry giants to gain control of his work. He championed the rights of artists at a time of great upheaval in the entertainment business, when the ability of artists to earn a living plummeted. If you are an artist who is less inclined to brandish a middle finger at the industry -- as Prince did -- or are not yet in a position to do so, then Rachel Moore's new book, The Artist's Compass, may be an invigorating read. In years past, there were many large companies willing to invest in the development of young artists with talent, but those are fast disappearing, and it is becoming more and more important for emerging artists to become self-starters and create their own opportunities. The incubators for developing artists may be largely gone, but so are the gatekeepers, which means that anyone can create their own opportunities if they're clever enough, determined enough, and talented enough to assess the marketplace and take advantage of what's out there. This sober, graceful "guide to building a life and a living in the performing arts" -- remarkably compact for such a sweeping purpose -- packs much useful information into its 180 pages. Perhaps its greatest value lies in its consolidation of nitty-gritty advice and broader, philosophical food for thought. Aimed at young people who aspire to a career in the arts, as well as those who are reinventing themselves in the arts, The Artist's Compass tackles practical matters of self-marketing, auditions, employment contracts, personal budgeting and finance; it also steers the reader through critical career decisions, girding them to face the more common challenges, while smartly avoiding a "one size fits all" approach. Most newly trained artists will find themselves operating as freelancers, working intermittently, figuring out where their next gig will come from and how to pay the rent until then. They will have been trained by experts but, as Moore sagely points out, "most teachers who are expert in their respective artistic disciplines are not necessarily expert in the business of the performing arts." That business has been profoundly altered -- for better and for worse -- by changes in demand and by advances in technology. Moore advises emerging artists on how to assemble their 'personal board of directors,' and how to harness tech not only to help them build their brand but also to streamline the logistics of their daily lives. Rachel Moore, President and CEO of The Music Center, at The Music Center's Ahmanson Theatre. Photo: John McCoy for The Music Center. A leading arts administrator, Moore is impeccably positioned to deliver this wide-ranging advice. Once a struggling artist herself, she saw her career in the corps de ballet of American Ballet Theatre cut short by injury at age 24, went to university, then rose to become the CEO of American Ballet Theatre. She is now President and CEO of The Music Center in Los Angeles. 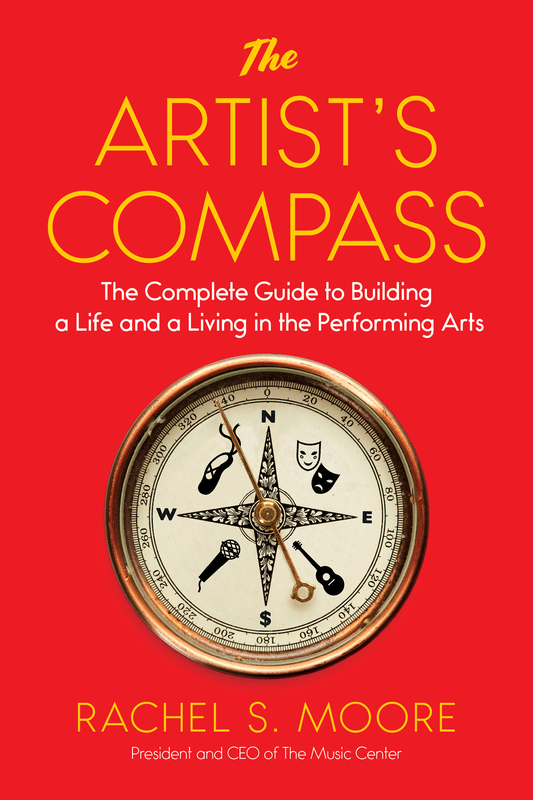 The thoughtful insights in The Artist's Compass reflect not just her own personal experience, but also that of an array of talents including Sigourney Weaver, Renée Fleming, Lang Lang, Misty Copeland, Natalia Makarova, and Daniil Simkin. Simkin, who has a massive social media following, shares his thoughts on social media do's and don'ts. Copeland understands that fame often fuels a backlash, and has employed an admirable strategy for dealing with online vitriol. Moore's own comical experience being interviewed for Vogue magazine offers a valuable lesson in handling the press. Rachel Moore, ballet dancer. Photo courtesy Rachel Moore. A vital chapter entitled 'When things go wrong' tackles nettlesome matters like workplace harassment sensibly and spiritedly. However, some of the space devoted to the perils of apartment subletting and traffic violations could more profitably have been diverted to navigating the increasingly common minefields in the music and arts world, such as breaches of intellectual property. Where penalties can be crippling, it is wise to be forearmed. A list of books by experts in finance and other fields can be found under 'Further reading.' But a few topics such as IP, partnerships, and situations that call for the creation of separate business entities, bear touching upon in this bird's eye view. Another area that merits exploration is fundraising, the cause of much angst among freelance artists. How can an artist chase grants if she can't afford a professional grant writer? Is crowd-funding all it's cracked up to be? Among the many pearls of wisdom in The Artist's Compass, one finds exhortations to explore other art forms, to engage with the world, to prioritize a formal education, and to consider making a home outside the major art capitals. Moore makes a compelling case for each practice she advocates. She also has advice on eating and sleeping. I vaguely remember my mother saying something along those lines, but, as is often the case, a parent's authority wanes in those late teen years. The Artist's Compass packs a lot more power than one parent's voice. Frank and engagingly written, it is likely to become a trusted resource for many an artist, even for those who are further along in their careers. Many artists become fearful when they hear the words "negotiate a contract." Visions of used-car dealers and fast-talking salesmen dance in their heads. Don't be afraid... It isn't about winning or losing, it is about finding common ground.